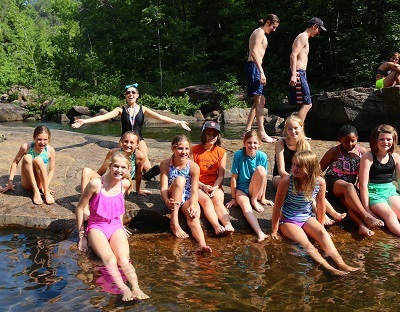 Retreats in "The Paradise of Youth"
The Athens Y Camps operate a retreat center at both our boys and girls camp sites. Our goal is to provide facilities, service and programs that make your visit an enjoyable and successful experience. 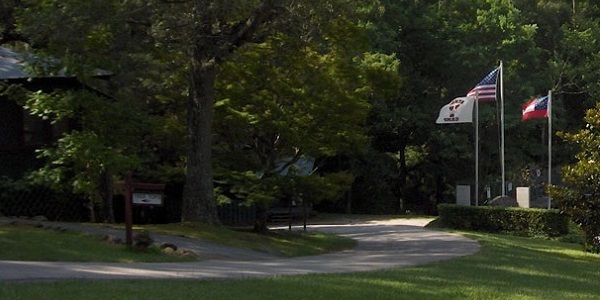 Our retreat centers offer a rustic setting with enough modern conveniences to provide a great experience. It is our goal for your group to have a wonderful time with us. We feel this is a beautiful and quiet spot to get away and relax, but we also have facilities available to provide your group challenging and fun activities. From church youth and adult groups, scouts or a school field trip, our retreat centers have you covered! Step into our rich history by entering our Lodge, the perfect place for a seminar or concert. 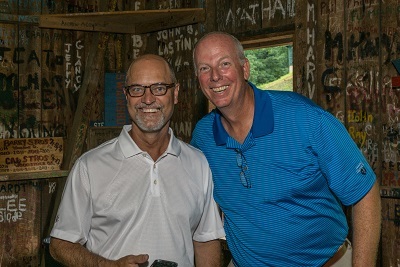 The rustic atmosphere created by generations for y campers writing on the walls and hanging signs is awe inspiring. Modern sound and projection equipment ensure your programs or concert is a huge success! Why Choose Our Retreat Centers? Location: easy access, only 1.5 hours from downtown Atlanta. Amenities: sound and projection equipment, ropes courses and Challenge tower, large meeting hall, athletic field, great food. Atmosphere: rustic outdoor experience in a beautiful natural mountain setting. Value: competitive rates with all inclusive fees. Our rustic style retreat center combines its 100+ years of character and tradition with some of the modern comforts and technologies of present times. We offer a wide range of facilities and program options to best serve you. Whether your goal is to use our accommodations to conduct your own programming or to call on our staff to lead selected activities for your group, our goal is to provide a safe and enjoyable experience for all. Contact our office at 706-754-6912 or email us to discuss how we can help you have the best retreat ever. We price our retreats by the number of people, nights staying and meals eating so have this information available when you contact us. Programming is available for additional fees. Just let us know how we can help! Run your own program or hire us to help out! We offer several programs for visitors to enjoy including Archery, Riflery, Canoeing, Rock-climbing, Rappelling, Hiking, Swimming and Campfires. Of course, we can meet just about any request for special programs as long as we have enough time to prepare for them. All of our activities are staffed by knowledgeable and certified instructors. Our goal is to ensure your group has a great time during your stay! When you host an event at the Athens Y Camps, you open up a world of possibility. Our pristine setting allows us to develop and facilitate programs that suit your needs. We offer team-building activities with our low and portable challenge course to full outdoor leadership development through eco-challenges and competitions. The AYC Challenge Tower provides individuals the opportunity to push their limits and conquer their fears. Our 55' high tower consist of multiple climb routes of varying degrees of difficulty, several individual and team oriented high elements and dual zip 300+' zip lines from the top deck. Our facilitators are some of the best trained and know exactly how to push you to do your best. Rates vary with the number of people in your group. 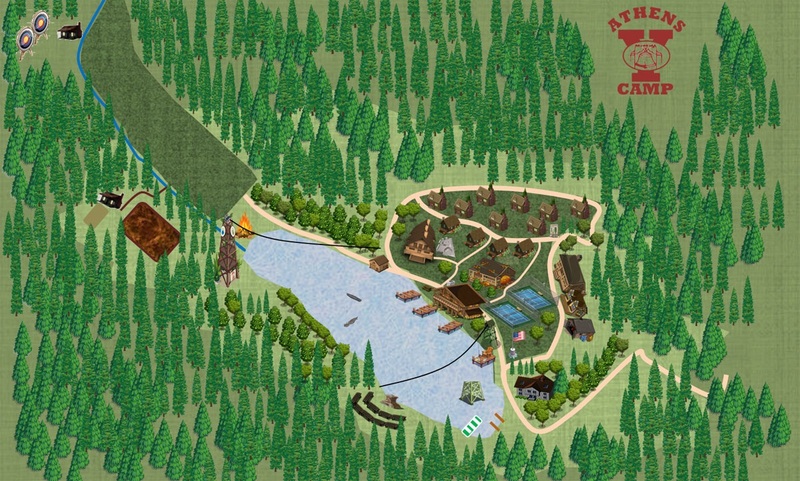 Our very own 5 acre Lake Pearson provides swimming, canoeing and fishing activities for your group. We offer two exclusive swim areas. One features a 3ft deep sand bottom baby pool. The other offers two low diving boards, one high dive, a 100' stainless steel waterslide, the "BLOB" (with the highest tower around), and an even higher diving tower centered in the swim area. Canoeing can be enjoyed anytime and is offered as a recreational program. Instructional lessons can be arranged for an additional fee. We have classic two person canoes as well as ten person war canoes. We provide certified lifeguards at all swimming and canoeing events. Copyright © 2019 Athens Y Camps.